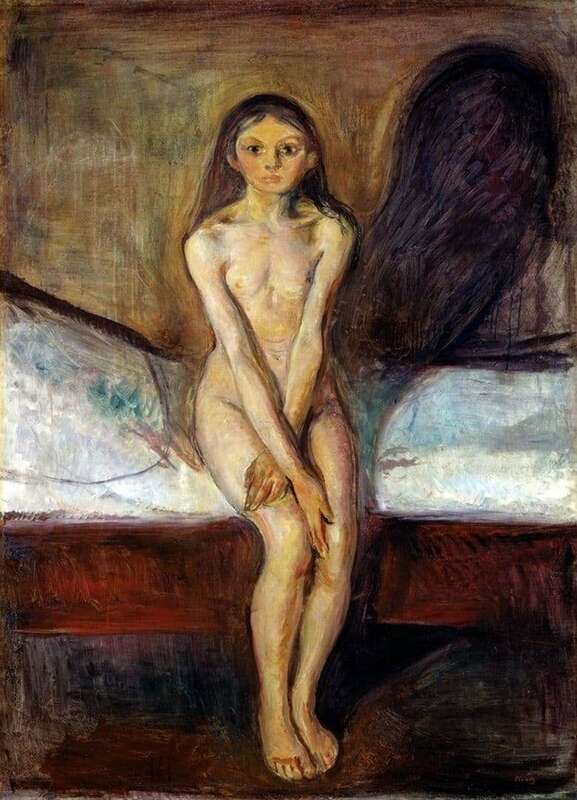 A naked teenage girl who found expression on the reproduction of Edward Munch’s “Maturation” has a deep and secret meaning. The girl is located on the bed, located in the corner of the room. The vertical shape and image of a teenage girl contrasted horizontally on a bed. On the left side is the main source of light, which falls on the wall, highlighting the very painful thinness of a young girl. Munch in the process of working on his picture depicted models that attracted and left a trace of vulgarity. However, if you look at the reproduction, you can see that there is no depravity in the picture. Munch portrayed the girl in dark colors, which symbolize his life and tragic events. The black shadow looming over the girl foreshadows an ominous future, and the uncertainty of maturation, which is uncertain. You can explain the shades of colors by the fact that the artist believed that maturation is a difficult period and process that can leave a mark on the soul of a person. The young girl depicted in the picture, acquired sexuality, but in the eyes you can read the fear of an unknown passion. The girl is trying to isolate herself from the unknown, so she opened her arms. In the painting “Ripening”, Munch managed to combine sexuality and fright, and this picture raises many questions and the desire to unravel the hidden meaning. The spectator, as well as the girl, eagerly and fearfully wishes to know the sweetness of maturation as soon as possible. The artist leaves the question open, so that each person will know and understand this process in his own way, since for one it can be frightening, but for the other – a sweet expectation. What the person sees in the eyes of this girl is unknown, and this is the same mystery as the period of ripening and adolescence. The most important thing is to meet this unknown worthy.